A classroom staple, the Geoboard is good for teaching many things. Shapes, symmetry, and coordinates. Use this one for all of these as a grid and axes numbers can be toggled on and off. Drag the bands on to the screen and then manipulate them. This resource is available for free online use or can be downloaded as part of the Numeracy Basics app. 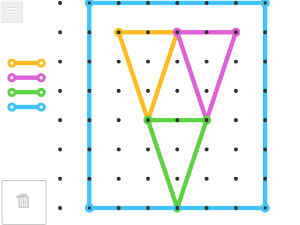 Go to free online Geoboard resource. A website full of teaching and learning resources. All are compatible with desktop and mobile devices. No subscriptions. No log-ins.